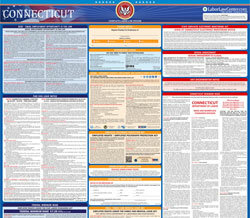 The Connecticut Restaurant and Food Service (English) is a miscellaneous law poster by the Connecticut Department Of Labor. This poster is mandatory for some employers, including employers who are in the restaurant or hotel restaurant business. This poster must be posted in a conspicuous place where all employees will see it that are in the restaurant or hotel restaurant industry. This poster describes minimum wages that must be paid to regular workers as well as handicapped workers and definitions for the various jobs. This poster also describes penalties to employers for violating this law. It appears you don't have a PDF plugin for this browser. Please see the link below to download connecticut-dol-79.pdf. also be available for inspection in connection with such wage records. (c) In the case of an employee who spends 75% or more of his working time away from the employer’s place of business and the  maintaining of time records showing the 	 	 beginning and ending time of each work period  for such personnel either imposes an undue hardship upon the employer or  exposes him to jeopardy because of his inability to control the accuracy of such entries, a record of total daily and total weekly hours will be approved as fulfilling the record-keeping requirements of this section. However, in such cases the original time entries shall be  made  by  the  employee  in  his  own  behalf  and  the time  entries  made  by  the  employee  shall  be  used  as the basis for payroll records. Under Connecticut General Statutes section 31-23 no minor under 16 years of age shall be employed or permitted to work in any restaurant. Sec. 31-62-E5. EMPLOYMENT UNDER OTHER WAGE ORDERS. (a) 	Mercantile:  	If an employee is engaged partly in the  	restaurant occupation  but is also engaged partly in the occupation  covered  by  the  mercantile  wage  order,  the provisions  of  the  mercantile  wage  order  shall  apply  to  the entire work period, except that, when time spent  in each occupation is segregated and separately recorded, the  allowance  for  gratuities  as  permitted  as  part  of  the minimum fair wage may be applied to  the hours worked by an employee in the restaurant service category. (b) 	Other: 	If  an  employee  is  engaged  partly  in  an 	occupation under the restaurant  wage order but is also engaged partly in an occupation covered by another wage order other than the  mercantile wage order, the higher provisions  of  each  wage  order  shall  apply  to  the  entire work period unless the time spent in each occupation is definitely segregated and so recorded. Where the time spent  in  each  occupation  is  definitely  segregated  and so recorded the provisions of the applicable wage order shall apply . SEC. 31-62-E6. DEDUCTIONS  AND  ALLOWANCES FOR  THE  REASONABLE  VALUE  OF  BOARD  AND LODGING has been repealed. SEC. 31-62-E7. DEDUCTIONS  has been repealed. SEC. 31-62-E8. DEPOSIT. No  deposit shall be required by an employer from any employee for a uniform or for any    other  purpose  except  by  permission  of  the  labor department. SEC. 31-62-E9. HOURS WORKED. Hours worked shall include all time during which the employee is required to be    on  the  employer’s  premises  or  to  be  on  duty,  or  to be at a prescribed work place, and all time during which an employee is employed or permitted to work, whether or not required to do so. Meal periods may be credited as nonworking time, provided the beginning and ending time of the meal  period shall be so recorded on the time records, and provided the employee shall be entirely free from  all    work  requirements  during  the  period  and  shall be free to leave the establishment. SEC. 31-62-E10. TRAVEL  TIME  AND  TRAVEL EXPENSES.Any employee who is required or permitted to  travel from one establishment to another after the beginning or before the close of the work day, shall be compensated for travel time  at  the  same  rate  as  for  working  time,  and  shall  be reimbursed for the cost of transportation. SEC. 31-62-E11. COMPUTATION OF TIME. All time shall be reckoned to the nearest unit of fifteen minutes. (a)	 RATE:THE FOLLOWING MINIMUM WAGES	ARE  ORDERED:$8.70    per  hour  on  1-1-14;  $9.15  per  hour  on 	 	1-1-15; $9.60 per hour on 1-1-16; and $10.10 per hour on 1-1-17 	except those 	persons employed 	under  this  wage  order  as  service  employees (waitpersons)	  shall  be  paid  $5.69  per  hour  plus 	gratuities on 1-1-14; $5.78 per hour plus gratuities on 1-1-15; $6.07 per hour plus gratuities on 1-1-16; and $6.38 per hour and gratuities  on 1-1-17 and bartenders at $7.34 per hour plus gratuities on 1-1-14; $7.46 per hour plus gratuities on 1-1-15; $7.82 per hour plus gratuities on 1-1-16; and $8.23 per hour plus gratuities on 1-1-17. (b) MINIMUM DAILY EARNINGS GUARANTEED:     An  employee regularly reporting for work, unless given  adequate  notice  the  day  before  to  the contrary, or any employee called for work in any day  shall be assured a minimum of two hours’ earnings at not less than the minimum rate if the employee is able and willing to work for that length of time. If the employee is either unwilling or unable to work the number of hours necessary to insure the two-hour guarantee, a statement signed by the employee in support of this situation must be on file as a part of the employer’s records. (c)  WORK  ON  SEVENTH  CONSECUTIVE  DAY: Not less than one and one-half times the minimum rate for all time worked on the seventh consecutive day. (d)  OVERTIME:  Not  less  than  one  and  one  half times the regular rate for all hours worked in excess of 40 in any work week. Sec. 31-62-E2. DEFINITIONS:(a)  “RESTAURANT  OCCUPATION”  includes  all persons engaged in the preparation and serving of food for human consumption, or in any operation incidental  or  supplemental  thereto  irrespective  of whether  the  food  is  served  at  or  away  from  the point  of    preparation,  and  irrespective  of  whether the  preparation  and        serving  of  food  is  the  sole business  of  the  employing  establishment  or enterprise, with  the exception that  this definition shall  not  include  the  preparation  and  serving  of food  in  a  non-profit  educational,  charitable  or religious  organization  where  the  food  service  is not  regularly  available  to  the  general  public,  or the    preparation  and  serving  of  food  in  hospitals, convalescent  homes  or  homes  for  the  elderly  where  the  food  service  is  not  regularly  available to the general public and is incidental to the care of the patient. This occupation includes but is not limited  to  employees  of  restaurants,  cafeterias, that    portion  of  hotel    business    involving  the preparation  and  serving  of  food,  commissaries, dairy  bars,  grills,  coffee  shops,  luncheonettes,  sandwich  shops,  tearooms,  nightclubs,  cabarets, automats,  caterers,  frankfurter  stands,  operators of  food  vending  machines,  and  that  portion  of the      business  involving  the  serving    of  food  in department and variety stores, drugstores, candy stores, bakeries, pizzerias,   delicatessens, places of  amusement  and  recreation,  commercial  and industrial establishments and social, recreational, fraternal  and  professional  clubs  which  either regularly  or  intermittently  serve  food,  as  well  as other  establishments  or  businesses  meeting  the condition stated in this paragraph. (b)  “RESTAURANT  EMPLOYEE”  means  any person  who  is  employed  or  permitted  to  work in  any  restaurant  occupation,  establishment  or enterprise. (c) “SERVICE EMPLOYEE” means any employee whose  duties  relate  solely  to  the  serving  of  food and/or  beverage  to  patrons  seated  at  tables  or booths, and to the performance of duties  incidental to  such  service,  and  who  customarily  receives gratuities. For the purpose of this order, a person shall  not  be  considered  to  customarily  receive gratuities  unless  a  minimum  of  $10.00  per  week in  gratuities  is  received  in  the  case  of  full-  time employees, or $2.00 per day in the case of parttime employees,  as  evidenced  by  signed  statements of the employee, stating unequivocally that  such  worker  did  receive  gratuities  as  herein  required, which  must  be  maintained  as  part  of  the  records of the employer. ( d )   “ N O N - S E RV I C E   E M P L O Y E E ”   m e a n s   a n employee other than a service employee as herein defined. A  non-service  employee  includes,  but is  not  limited  to,  countergirls,  counterwaitresses, countermen, counterwaiters and those employees serving  food  or  beverage  to  patrons  at  tables or  booths  and    who  do  not  customarily  receive gratuities as defined above. (e)  “GRATUITIES”  means  a  voluntary    monetary  contribution received by  the employee directly from a guest, patron or customer for service rendered. Sec. 31-62-E3. GRATUITIES AS  PART  OF  THE vMINIMUM  FAIR  WAGE. Gratuities  may  be recognized as constituting a part of the minimum fair wage when all of the following provisions are complied with:( a )   T h e   e m p l o y e e   m u s t   b e   e n g a g e d   i n   a n employment  in  which  gratuities  have  customarily and usually constituted  and have been recognized as  part  of  his  remuneration  for  hiring  purposes and(b)  The  amount  received  in  gratuities  claimed as  credit    for  part  of  the  minimum  fair  wage must  be  recorded  on  a    weekly  basis    as  a s e p a r a t e   i t e m   i n   t h e   w a g e   r e c o r d   e v e n though  payment  is  made  more  frequently  and 	 	(c)  Each  employer  claiming  credit  for  gratuities as  part  of  the  minimum  fair  wage  paid  to  any employee shall obtain weekly a statement signed by the employee attesting that he has received in gratuities  the  amount  claimed  as  a  credit  for  part of  the  minimum  fair  wage. Such  statement  shall contain the week ending date of the payroll week for which credit is claimed. Gratuities received in excess of 34.6% in 2014 and 36.8% in 2015, 2016 and 2017 for service employees and 15.6% in 2014 and 18.5% in 2015, 2016 and 2017 for bartenders need not be reported or recorded for the purposes of this regulation. Division, Department of Labor, 200 Folly Brook Blvd., Wethersfield, CT 06109-1114.